It was a solid, winning week in the golf last week although it was a rather interesting one. The work I put in on the golf every week and the betting tips takes me awhile. Each tournament will usually take 1-2 hours and sometimes more depending on how invested I am. I’m crunching stats, running simulations, re-watching holes/tournaments and even reading certain players Twitter or news about them to see if there is a reason there to back them or not to back them. But then there’s also your gut. 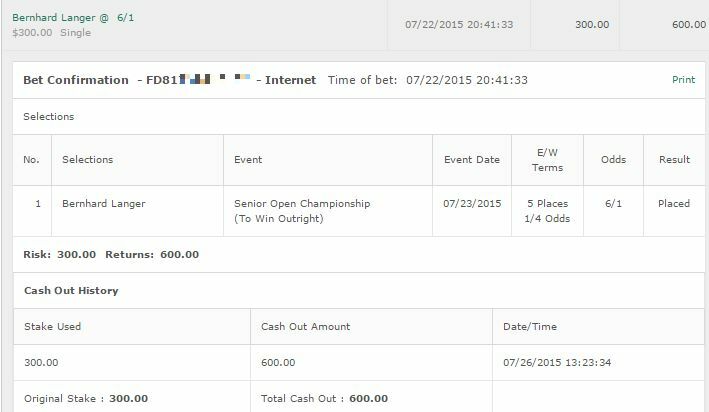 Last week, I tipped a bet on Jordan Spieth to win. His form has been – let’s say erratic – lately. There was no real reason to pick Jordan Spieth to win the D&D Invitational. I just had a really strong gut feeling about it. A great performance from Jordan Spieth all round, and a nice winner winner chicken dinner. My first bet is another gut play, and I’m taking Jason Day to win however I am only betting half a unit. 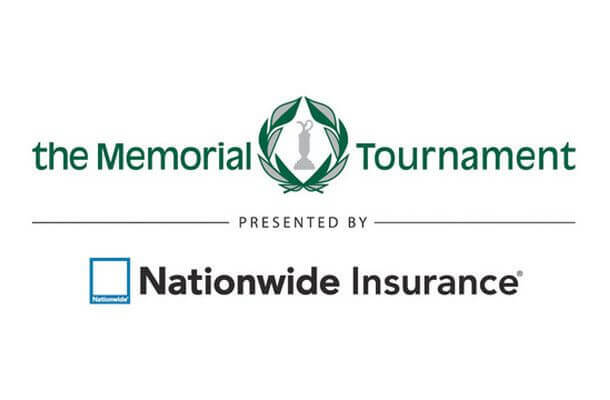 The Memorial Tournament takes place at the Muirfield Village Golf Club designed by Mr. Nicklaus, and it’s not a place where Jason Day has performed well at. In 7 performances he’s never once cracked the top 10. However he is in spectacular form at the moment and I just have a good feeling about him here. Due to his past struggles on this course though I’m only going for half a unit on him. I’m also taking the in-form Matt Kuchar for half a unit, to win and E/W. The 2013 winner of this tournament by 2 strokes, Kuchar has performed well here in the past. Due to the big 3 playing his odds are very good, and Kuchar has had some extremely good performances as of late like 3rd at the Players Championship and Byron Nelson, and 6th at the D&D Invitational. I’ve got to go with Kuchar here at that price. 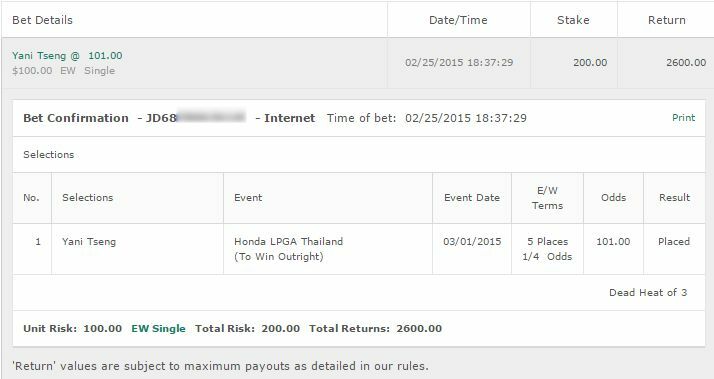 Finally, a half unit bet on Hideki Matsuyama to get a Top 10 Finish. This is almost the opposite of my gut play on Day and Spieth last week – my gut says Matsuyama will NOT do well here. But his stats all line up correctly here and he has performed well at this tournament before. I’m going with a half unit on a Top 10 finish for Matsuyama at 6/4 odds. I may also throw quarter unit bet on him to win simply because I’d be kicking myself if he did, and I didn’t bet it. The price isn’t as great as I had hoped through. What we all know as the Scandinavian Masters takes place this week. It’s quite an interesting and open field with Henrik Stenson leading the favourites at 13/2, followed by Lee Westwood and Alex Noren. 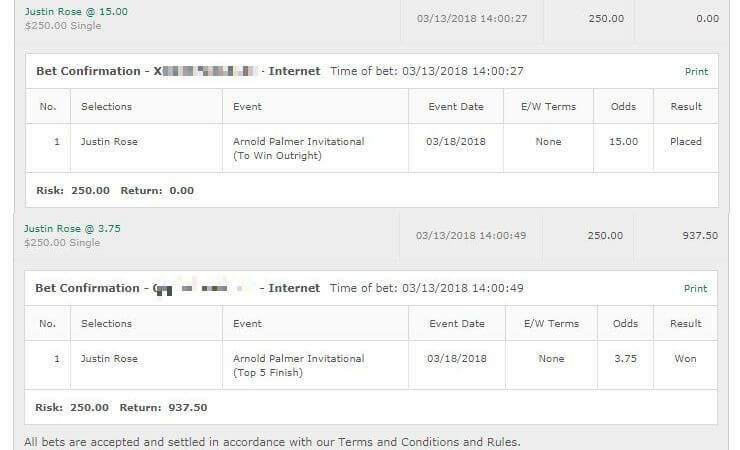 First of all I’ve got to jump on multiple time winner Alex Noren to win and E/W for half a unit. Not sure if he can repeat but he’s had some good form lately. Yeah he struggled a lot at the BMW PGA Championship on the last few days but he started well there. It wasn’t so long ago he racked up two top 10 finishes in a row at the China Open and Spanish Open, and I think he will be confident here. The price is enough for him knowing his ability to crack the Top 5 at this course. I’ve also got my eye on Rikard Karlberg. Surprisingly the books do too – I thought he might be a higher price than 30/1. Based on that I’m going to take him for just a quarter unit to win and E/W. I’m also going to take the same bet on Fabrizio Zanotti who has performed well here at the past and is in some decent form at the moment.